While a Bourbon Old Fashioned Wisconsin may be a great drink, and the beer inspired by it was excellent (see my earlier post this week), Wisconsin is really a Bourbon state, at least when it comes to mixing up the state drink, the Old Fashioned. The brandy old fashioned has stood the test of time, and has become a signature drink many bars and supper clubs. Since Brandy is the alcohol of choice at many Wisconsin Supper Clubs, it seems only right that the guys at Mobcraft would age some of their base Old Fashioned Berliner Weisse in Brandy barrels. After having the Bourbon Barrel Old Fashioned and being pleasantly surprised by it, I figured what better to do that open up a bottle of Brandy Barrel Old Fashioned for comparison purposes. Theoretically the two should be very similar since the only difference is the type of barrel that the beer was aged in, but brandy and bourbon do have distinct flavors. Before getting into the review, take note on the eminent social commentator Lewis Black’s opinion of Wisconsin and Brandy Old Fashioneds, and drinking in Wisconsin in general. Brandy Barrel Old Fashioned does not currently have a score on either Beeradvocate or ratebeer. This beer plays off two things that are very "Wisconsin" German Heritage and Old Fashioneds, Casey suggested a traditional German recipe, Berliner Weisse (a moderately sour wheat beer) featuring some elements of the classic Wisconsin cocktail the Old Fashioned (Cherries, Oranges and a few of the spices found in bitters). Brandy Barrel Old Fashioned pours a very clear copper with a moderately thick, creamy white head with slight rocky breakup. The head holds moderate retention (~2 min) before leaving thick lacing behind in the glass. The aroma, similar to the bourbon barrel aged version is very reminiscent of an old fashioned. Orange and cherry lead with notes of sweet brandy, tart lactic acid from the lactobacillus added to the beer to give it more complexity. Lactobacillus is more commonly featured in yogurts, giving plain yogurt its characteristically tart and slightly sour flavor. Light herbal notes round out the aroma with the core spices, cardamom, juniper and star anise all playing a part. As with the bourbon barrel aged version, the brandy barrel aged release really nails the Old Fashioned aroma. In this variation however, the spices are a lot more subdued with the fruit and alcohol taking center stage. Brandy leads the flavor with a strong blend of citrusy/herbal cardamom. Sweet cherries round out the sweetness, blending into a slight tartness, likely owing to the lactobacillus that was added to the brew. As with the bourbon barrel aged version, the brandy-aged Old Fashioned release has notes of both club and lemon-lime soda, likely resulting from a combination of the production of lactic acid, as a by-product of lactobacillus, during fermentation and the resinous flavor of juniper berries. After the initial tart/sour notes from the lactobacillus, which remain in the background, the finish is sweet and smooth with the brandy and fruits coming to the forefront again culminating in a citrusy aftertaste. The herbal notes of the star anise are restrained throughout the Brandy Barrel Old Fashioned, adding complexity without ever coming to the forefront. As with the Bourbon Barrel version, this one has a moderately light body and a moderate level of carbonation, bringing the experience even closer to drinking an Old Fashioned. 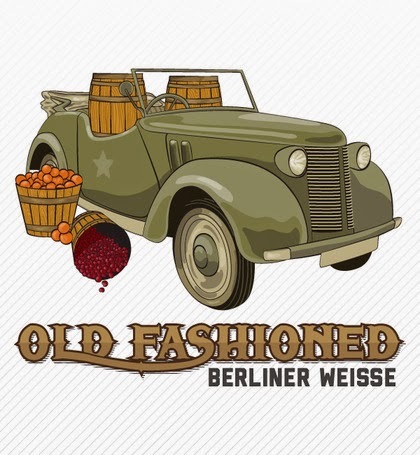 After drinking the Bourbon Barrel Old Fashioned Berliner Weisse, I thought I knew what to expect out of the Brandy Barrel release. Heading into a new beer with prior expectations rarely works out well however, and while the beer added into the two different barrel types was the exact same beer, the choice of barrel effected the two releases differently and created two distinctly different beers. Visually, the brandy barrel release is noticeably darker shade of copper than the bourbon release. While the herbal notes of star anise and juniper berries were prominent in the bourbon barrel aged beer, they were much more restrained after the beer was aged in a brandy barrel. The brandy release is also sweeter and smoother than the bourbon release, which could be a difference in distilleries, or could be due to the sweeter nature of brandy. When it comes to barrel aging, especially in barrels that were previously used for spirits, a lot of the flavor gained comes from what was previously in the barrel. Even the same beer aged into two barrels that held the same spirit at the same distillery can produce beers that taste different, but that’s where blending plays into the eventual flavor experience. In this case, The Brandy Barrel Old Fashioned highlights how different spirits barrels can affect the flavor of the same beer. As with the Bourbon Barrel Old Fashioned, the Brandy Barrel release presents a drinking experience very close to drinking an actual Old Fashioned. This release shows that the guys at Mobcraft really know their stuff! Cheers again to Casey Groh for submitting this recipe concept, and cheers to Mobcraft for pulling this off! In case you missed it in my bourbon barrel post, check out the Mobcraft Craftfund site, and if you are feeling generous, chip in some cash to help them expand and ramp up production! That’s all for today, check back soon for my next post! Happy Drinking, and always remember to Drink Wisconsinbly! I am reluctant to drink alcohol as I easily get hangovers and really ruins my productivity the next morning. A friend of mine told me about Detoxicated and now I can enjoy my glasses of wine without feeling crappy the next day! It’s a total life saver. How to know about how to treat a hangover? you can visit their website for that.